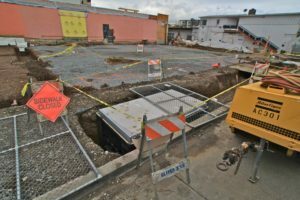 The first Ohlone skeleton disturbed by Berkeley construction workers on March 29 was alarming. But of course the work was allowed to continue because few pay attention and money talks. The second ancestral remains unearthed on April 27 are now too much to ignore. The Ancestors are calling. I cop to being one of those Berkeley environmentalists who travels all over trying to help save the planet, but when it comes to “act locally” I’ve come up short, at least up until now. Often, following a film screening — wherein our stories depict valiant attempts by indigenous people to protect their sacred places — I am asked by audience members: “What can I do?” After many different attempts to answer that question, I feel the best and most important answer I’ve come up with is: “Work with local indigenous people to restore a sacred place.” Well, right now we have that opportunity in Berkeley, and we should seize it. Much work lies ahead: Gather a movement. Stop a mega-development. Protect a sacred place. Honor the history. Follow the leadership and spiritual instruction of the native people of this place. An open space sanctuary restored to natural habitat with Strawberry Creek flowing through. A place available to Ohlone people to remember and honor the ancestors, to gather, sing, leach acorns, learn the language. A memorial park where Berkeley residents can reconnect with quiet, simple, eternal truths. A place for East Bay third- and fourth-graders learning California history to go for field trips during which docent-led walks bring the 12,500 years of native history alive. Having one place that turns the tide and pattern of history. Knowing that for once things were done differently. 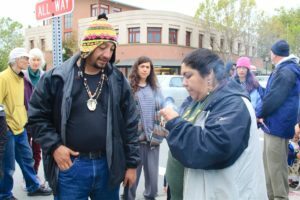 CALL TO ACTION: If you would like to be on an email list to receive information about the upcoming campaign to save the West Berkeley Shellmound site, send an email to slfp@sacredland.org, subject line “Berkeley Ohlone Shellmound” and we’ll be in touch. Thanks. You should also get on Corrina Gould’s email list via shellmoundwalk@yahoo.com and check out her Indians Organizing For Change website.